I’m a Forex trader, recently replacing the income from my past career to earn a full time living from the markets. I also featured on Rob Booker’s network in a podcast and following webinar, discussing how I use my process combined with robot trading to improve my results. During mid-late 2016 I finished writing the book about robot forex trading and how I learned to trade foreign exchange and earn my living from the markets. 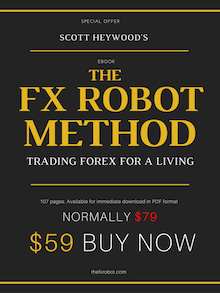 If you’re an active or prospective FX trader I believe my book might help you arrive at a very successful and stable system to trade using robots. In the book I incorporated as many requests from Rob Booker’s audience as as possible, to make it the ideal resource for the aspiring trader with questions about the role of robots in trading success. As I point out in the book, I believe my education process is ongoing. As I find useful new tools and information I would like to pass these on to anyone interested – if you subscribe here I’ll aim to keep in touch through my regular newsletter.